Do you own an iPod? Would you want to use it in your Car? There are a few ways to get an iPod to work in your vehicle. Below we have put information to help you choose which option is best for you and your car, how they will work and which gives you the best sound. 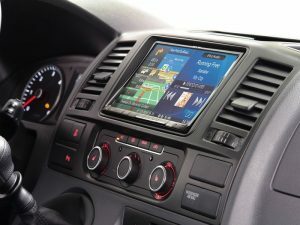 By changing the radio in your vehicle (if this is do-able) you will get a much better sound through the original speakers and you will have full control over your iPod (Songs, Genre, Playlists, Albums, Audio books, Podcast etc). Whenever the iPod is plugged in it will charge as well (iPod dependant). It is widely known that Alpine radios have the better controls for iPod integration and they all have the ‘Made for iPod’ tag allowing them to work seamlessly with the iPod. If you no longer use cd’s then there are radios available that are purely designed for media devices such as iPods and USB memory sticks. 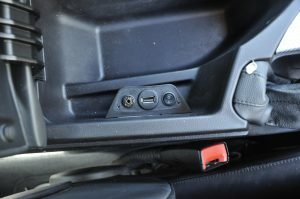 This option is our most popular as it gives much better sound from the iPod through the cars existing speaker system. If you have any controls on the steering wheel, you may be able to interface these to the new stereo so you can still utilise them. This option integrates into the car without changing the factory stereo. It links into the cd changer port (if available) and will give combined control from the iPod and the stereo. There are a few different manufacturers of this type of device and some will give you more control than others. We always ask you to call to speak to us when discussing this option as there are so many questions we need ask before we can quote on this type of interface, this is to allow us to make the proper decision on which is the correct part for the job. 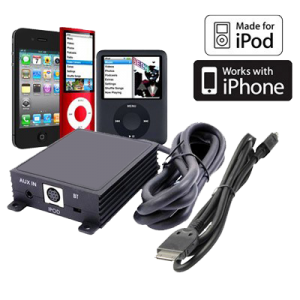 This system is a wired interface and uses a high quality digital transmitter to send the audio from your iPod to your stereo via an FM radio channel. By the use of a switch, you can block the FM transmission which then in turn converts it to a “Line in”. This option will charge the iPod (depending on the model of the iPod), and will give a good quality of sound (compared to the cheap transmitters that plug into your cigarette socket). This option is a universal solution and will work with any stereo and any vehicle. If you have any queries about iPod Integration, please click the button below to contact us. Absolutely brilliant, outstanding service from advice on which alarm to have, very professional install and great introduction to the system when it’s fitted. I’d recommend these to anyone. Well done!